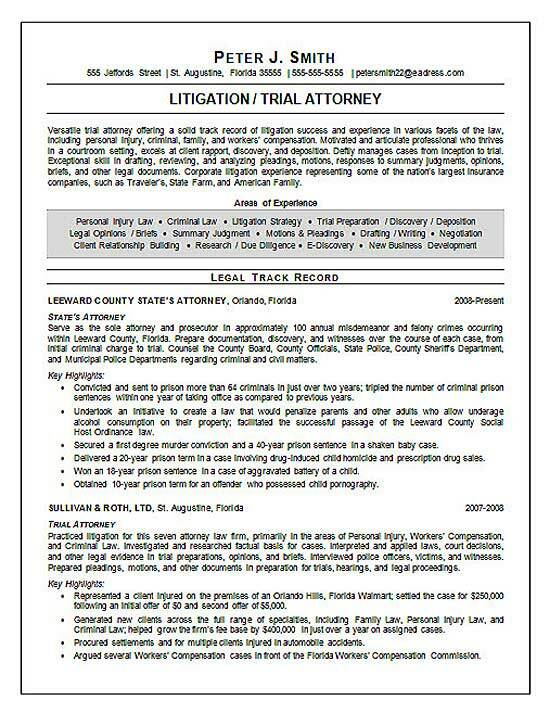 This post includes a resume example for a professional with experience as a Trial Attorney. This is a good general resource for any lawyer / attorney. The summary begins with a job title heading and paragraph that outlines their career experience. And areas of expertise section provides a snapshot of their core skills such as litigation and personal injury law. Additional qualifications are listed that include trial preparation, discovery, motions and pleading. The job seeker also has experience providing legal opinions and monitoring depositions. The legal track record lists past jobs with standard headings. A paragraph documents responsibilities at each job position. For example, the recent job states they are responsible for legal aspects of misdemeanor and felony cases. The paragraph goes on to explain the counties with oversight along with duty to manage all legal aspects from criminal charge to trial. The bullet points feature achievements and key trials where a case was decided in their favor. The last section lists education as Juris Doctor with a B. S. in Psychology and Sociology. 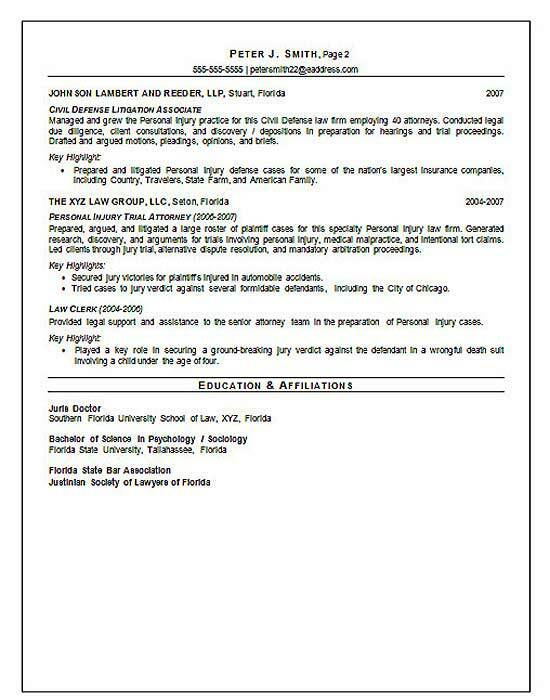 Professional affiliations include the Florida Bar Association. Assess liability and potential damages for defense of property damage law suits. Represent corporation and clients from initial case assignment through settlement or trial and appeals. Develop defense that lead to acquittal, settlement or mitigation of losses. Analyze completed cases, determine if candidate for appeal and manage appeals process for such cases. Conduct legal research, draft supporting documents and file proper paperwork with courts and judges. Plan, organize and deploy legal procedures related to arbitration. Collaborate with property claims department to conduct litigation due diligence sessions. Work with legal teams to advise claims personnel and executives about legal best practices, precedents and processes. Meet with clients, agents, opposing counsel and judiciary in order to gain information on the case status and reassess cases.